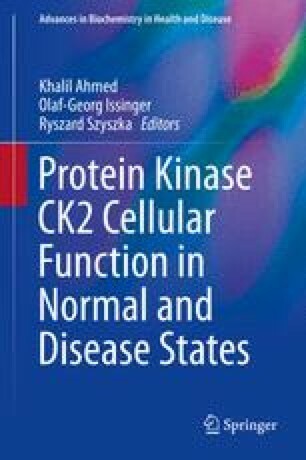 The mechanism of regulation of CK2 differs from those common to other eukaryotic protein kinases and is not entirely established yet. Nowadays, several crystal structures of the tetrameric α2β2 holoenzyme are available, supporting a structural model of an autoinhibitory regulation by oligomerization proposed several years before on the basis of biochemical, biophysical and functional data. Monoclinic crystal forms of the holoenzyme reveal the symmetric architecture of the “free” isolated active tetramers. The dimension and the nature of the α/β interfaces configure the symmetric holoenzyme as a strong complex that does not spontaneously dissociate in solution, in accordance with the low dissociation constant (≈4 nM). Hexagonal crystal forms of the CK2 holoenzyme show an asymmetric arrangement of the two catalytic α-subunits around the obligate β2 regulatory subunits. These asymmetric α2β2 tetramers are organised in trimeric rings and filaments that correspond to the inactive forms of the enzyme, whereby the β-subunit plays an essential role in the formation of inactive polymeric assemblies. The derived structural model of (down)regulation by aggregation contributes to the interpretation of many available biochemical and functional data, although it awaits for a more comprehensive validation at the cellular level. These findings pave the way for the design of novel strategies aimed at the modulation of the CK2 activity. This work was supported by Italian Miur (PRIN 2008, R.B. ), by FEBS (Distinguished Young Investigator Award, GL) and by the University of Padua (Progetto Giovani GRIC101044, GL).